Violet Transmuting Flame™ essential oil blend contains 3 essential oils: Violet Leaf Absolute, Sandalwood, & Lavender. It also contains crushed amethyst & tourmaline crystals & dried lavender, blended in jojoba base oil. The presence of the lavender & the crushed crystals add to the therapeutic aspects of the oil blend to vibrationally access your energy centers & assist in transformational processes. The properties of the oils & crystals that assist with the transformational processes are described in the next paragraphs. Violet Leaf Absolute invokes a calming, beautiful, & gentle response – ideal for meditation, & restoring a positive attitude to life in general. Many references call violet leaf absolute an “oil of springtime” — for creating new beginnings & new growth. Violet leaf is said to support emotions and the heart – to soothe both nostalgia & obsession. It has also been said that it helps to overcome fears, shyness, & promote confidence, & self-esteem. When used on a regular basis Violet Leaf Absolute will encourage a positive vision for the fulfillment of your personal & professional goals. 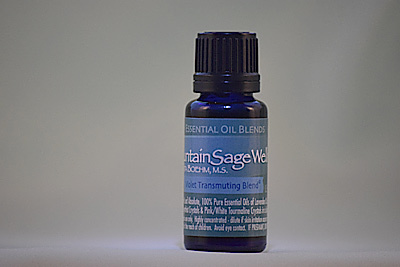 It is a brilliant oil to diffuse, while working or involved in a creative project. Violet Leaf’s mossy aroma is unlike that of the flower. Violet Leaf Absolute accesses both the crown & throat charkas. Violet Leaf Absolute has anti-inflammatory compounds and many sufferers of rheumatism and arthritis have found it to be an effective remedy when massaged into their painful muscles and joints, ease headaches and migraines as well as dizziness, anxiety and nervous exhaustion, the antiseptic action of the oil relieves bladder and ureter inflammation. It especially effective on dry skin, helps soothe and heal skin as well as thread veins. It is also a natural treatment to deal with common skin conditions like acne and eczema. Violet essential oil is considered safe for topical use so long as you take the precaution of diluting it first. Violet Leaf Absolute has anti-inflammatory compounds and many sufferers of rheumatism and arthritis have found it to be an effective remedy when massaged into their painful muscles and joints, ease headaches and migraines as well as dizziness, anxiety and nervous exhaustion, the antiseptic action of the oil relieves bladder and ureter inflammation. It especially effective on dry skin, helps soothe and heal skin as well as thread veins. It is also a natural treatment to deal with common skin conditions like acne and eczema. Violet essential oil is considered safe for topical use so long as you take the precaution of diluting it first. The Chinese, Ayurvedic, & Tibetan medicine regard Sandalwood essential oil highly for its therapeutic effects as well as its ability at being able to center the mind in meditative yoga practices. It is also great as a tonic for a hyper active mind & is considered to be an anti-depressant as it can help to relieve agitated emotional states, over thinking, & worry. Sandalwood accesses the root chakra to ground us. Sandalwood promotes mental clarity and memory, may reduce inflammation, supports healthy blood pressure, inhibits tumor growth, can boost low testosterone, acts as an aphrodisiac and as a natural deodorant and cologne. Promotes relaxation, clarity and focus. Lavender essential oil strengthens the nervous system, clears thinking, dissipates fear, reduces worry, & balances extremes of emotion to draw one toward emotional equilibrium. It also accesses the solar plexus area to help us tap into our “gut” feelings & self worth. Dried lavender was included in the blend from my own inner guidance. Lavender soothes and protects skin, assists in cleansing the liver, boosts kidney and urinary health, helps reduce bloating and gas, acts as a sleep aid and soothes sore muscles. Tourmaline has become a focus of research in universities & research centers worldwide. The reason – tourmaline is the only mineral to show permanent electricity on the earth & is also a natural source of negative ions & far infrared rays. Tourmaline crystals used in this formula relate to creativity & to conceiving of the “new” while allowing one to maintain the connection between the self & “All That Is”. It aligns the energy centers & meridians of the physical body to the optimum energy centers & meridians of the ethereal body. It also stimulates the crown chakra & the heart chakra — bringing forth a synthesis of love & spirituality, while enhancing the higher aspects of the state of love. It also promotes peace & joy during periods of growth & changes — the changes encountered when being guided toward a path of enlightenment. Amethyst is a “stone of spirituality & contentment”. It facilitates transmutation of lower energies into the higher frequencies of both the spiritual & ethereal levels. It is representative of the principles of complete metamorphosis. It is also a “stone of meditation”, being excellent in conducting energy of calm & peacefulness to help one bother enter & maintain the state. It opens & activates the crown chakra. Suggested Uses: These blends can offer therapeutic value to daily routines using any of the following methods. Place a drop under nose or onto specific points (i.e., acupressure points, trigger points, etc.) for additional therapeutic effects. Use in an aroma diffuser (just a few drops in water) for therapeutic inhalation effects. Add a few drops to a bath, vaporizer, compresses, etc. or add additional base oil for massage. Essential oils are also great for enhancing any mindful practice including: meditation, yoga, and Qigong. Therapeutic effects of essential oils are vast and vary for each oil (i.e., emotional balancing, muscular, circulatory, respiratory, etc.). Do not use if pregnant. If skin irritation occurs, add more base oil (i.e., jojoba oil) or discontinue use. Avoid eye contact, swallowing, and contact to open wounds. Violet Transmuting Flame essential oil blend can be used to help with shin conditions, urinary discomforts, headaches, anxiety, mental clarity, deep relaxation and insomnia.